Mothers are truly treasures, and on Saturday, May 12, the San Pedro Town Council showed their appreciation for the town's mommies with a special program designed for laughter, entertainment and lots of love. Headlining the evening was Pierre David (Parodiando of Mexican TV), but before he could come onstage and give his performance, there were many activities scheduled to warm up the crowd before his act. After the national anthem and heartfelt prayers, Mayor Daniel Guerrero gave a touching speech to the 1,000 plus mothers in attendance. He expressed his gratitude to all the mothers - past, present and future - who take care of us on the island. He indicated that though he felt the loss of his own mother, he was grateful for the time and memories he had of her and implored those who still had the gift of their mother's presence to show appreciation not only on one day, but every day. With the formalities of the opening ceremonies done, there was a lot of entertainment lined up. 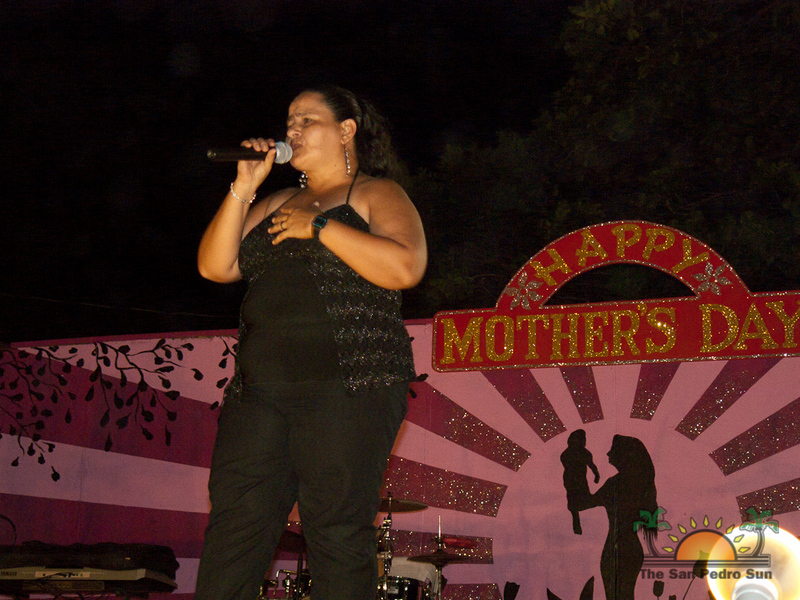 From a beautiful ballad sung by Elina Palma, to dance presentations from San Pedro Dance Company, Barbara's Dance Group and Ayanna Staine, mothers were treated to much singing and dancing. 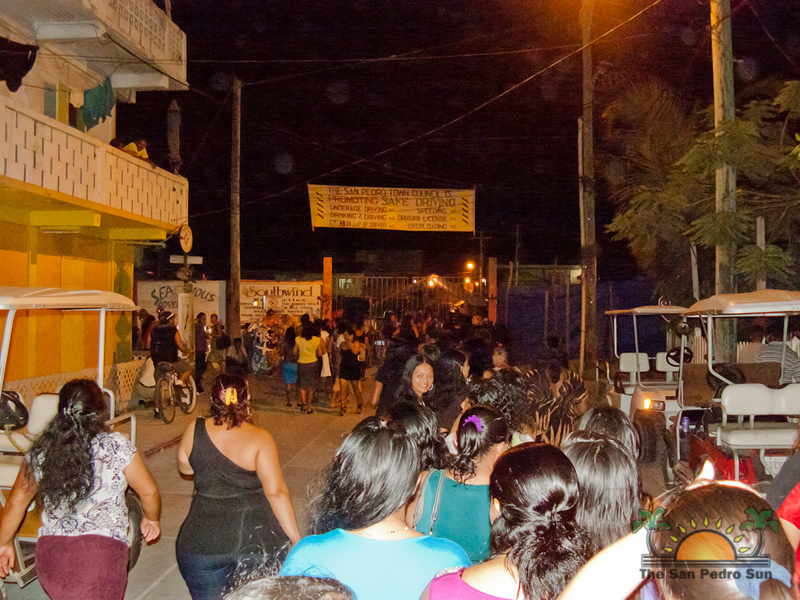 There were many giveaways as well, with fantastic games organized to make the night even more interesting. 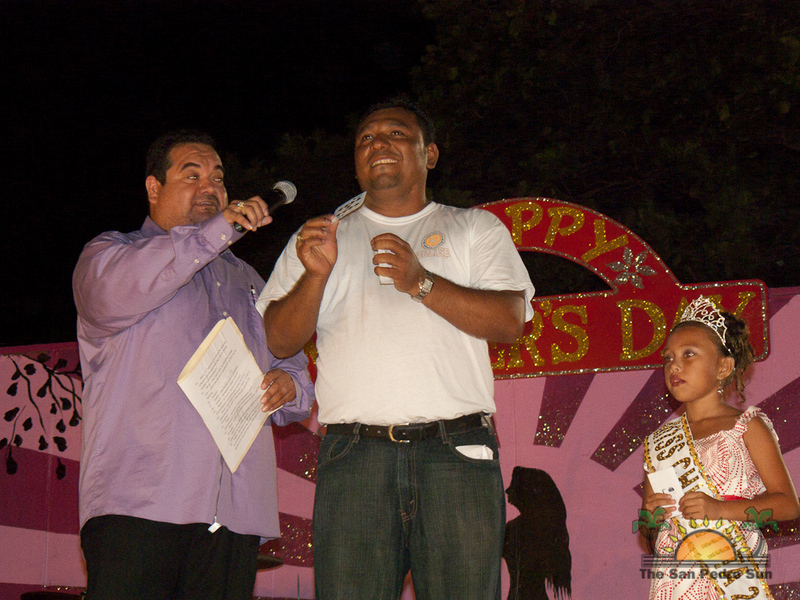 Master of Ceremonies Eiden Salazar Jr. was the master on stage, charismatic and funny, leading the games with aplomb. 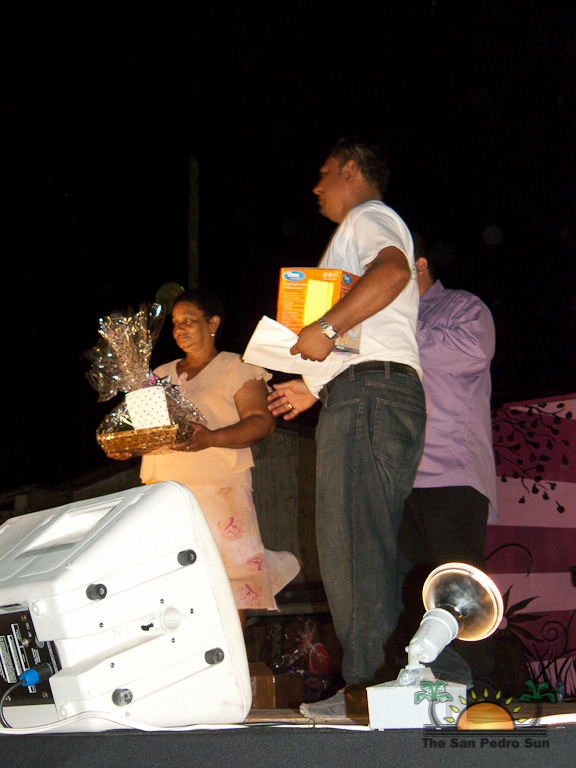 The mother with the prettiest, sparkling, "blinged-out" shoes won a prize, the mother with most daughters in attendance, the first mother onstage with a picture of her vehicle won a gift certificate, mothers who were sitting on a chair that had a sticker underneath also won prizes, the oldest mother in attendance (85!) won a beautiful rocking chair and the games went on throughout the night. The highlight of the evening was the announcement of Mother of the Year. Miss San Pedro Yakarelis Hernandez, Miss Lions Shantell Pascascio and Mother of the Year Yoli Ayuso were onstage to crown Mrs. Medrano as San Pedro's Mother of the Year for 2012-2013. 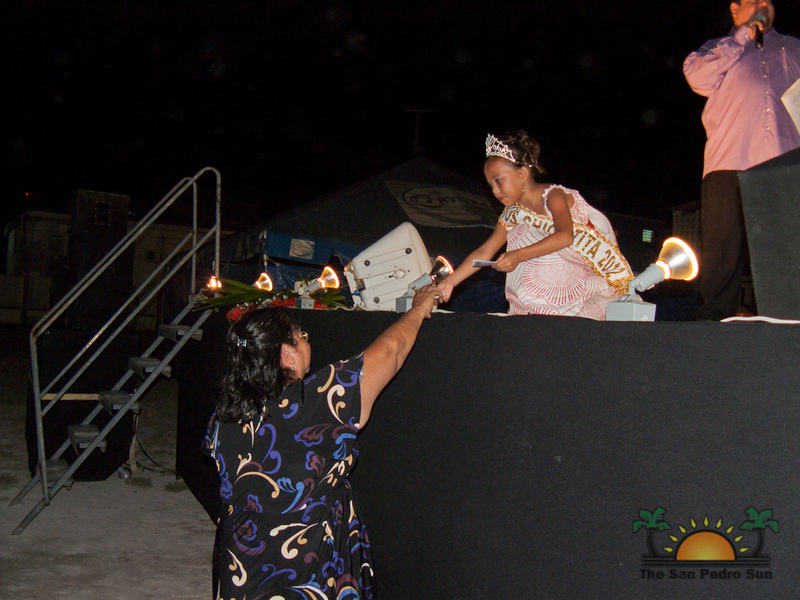 She received a sash, tiara, bouquet of gorgeous flowers, gift certificates for an all-expenses paid trip to Chetumal, Mexico, a microwave oven and some cash – all prizes donated by generous sponsors of the evening. 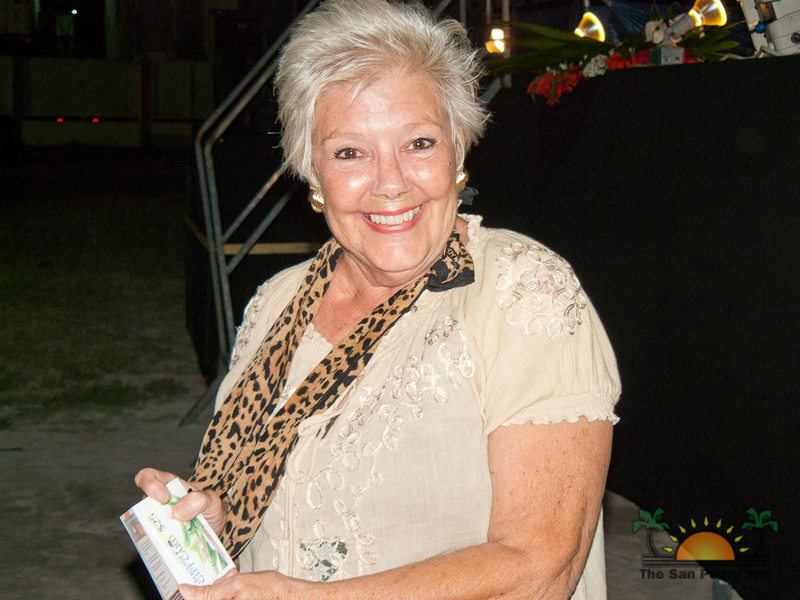 After being congratulated by Mayor Danny and Area Representative Manuel Heredia Jr., Mrs. Medrano was escorted to her seat to enjoy the rest of the evening’s fine entertainment. 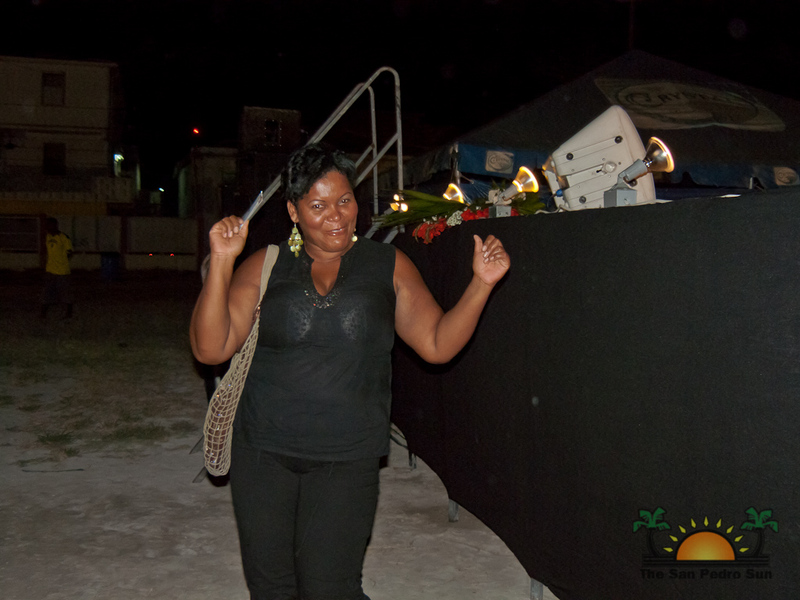 The fun really got underway with a singing and dancing competition amongst the brave mommies who took to the stage. After that proper stage warm-up, it was time to bring out the star of the evening: Pierre David. Bringing his unique blend of naughty comedy, singing talents and humorous imitations of such artists as Vicente Fernandez, Kalimba, Camila, Luis Miguel, Paquita la del Barrio and more, Pierre certainly had the audience splitting their sides with laughter. The few men who were in the audience were surprise 'victims' of jokes, and no-one was safe: not Mayor Danny, Mr. Heredia, MC Eiden, the volunteer servers, or even the media! However, they were all gracious and went along with the show. Kudos gentlemen! It was a fantastic evening for all in attendance, and the San Pedro Town Council is commended for putting on a great show yet again.